A car holster can be a useful tool for everyday life. 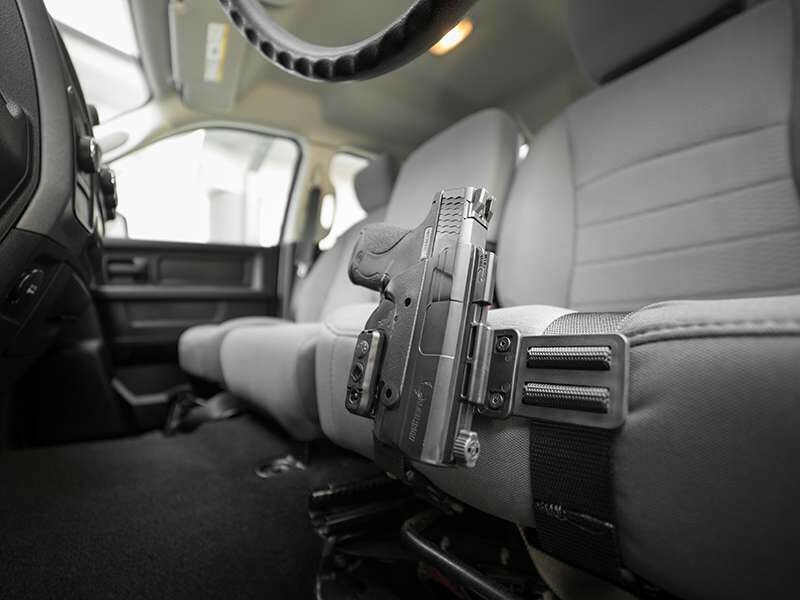 Many holster mounts (Alien Gear's included) require some sort of installation — primarily drilling a mount beside steering columns, within glove boxes or into center consoles. What if that wasn't necessary? The ninth addition to the ShapeShift Modular Holster System provides a way to comfortably holster a weapon between the legs in a car or truck without any structural changes to the vehicle. I could see some peace officers becoming a bit nervous if they approached your vehicle and saw that between your legs. As with all our products, we recommend our customers take into account their respective state laws before using any carry style, be it on or off the body. We cannot provide legal advice if pulled over by law enforcement, but we do recommend respecting the on-duty officer by clearly keeping your hands on the wheel and responsibly making them aware that there is a weapon in their line of sight within the vehicle. My comment had nothing to do with state laws. It's simply a matter of a peace officer looking in the vehicle and seeing a pistol front and center. It's just my observation that this might put many officers on hyper alert. That's just my opinion and not a reflection on the quality or functionality of your product. @G26Raven : I agree. That's the first thing I thought of when I saw the picture. Laws have nothing to do with. Possible justifiable officer paranoia is the issue. The other thing that occured to me is the temptation to leave the gun there if you're just running in someplace. Everyone knows that would not be a good idea, but you some people would do it. What I can see that might have potential here is if the holster could be re-positioned on the mounting belts so that the holster was under the seat with the rear of the gun facing forward and the gun out of sight. I might buy something like that. @AlienGHolsters : Is that possible? This seems like a nice product, but also something that I question the need for. I think there is too much potential for problems here - a bad accident could leave you unconscious and your gun available to anyone, or if you have to exit your vehicle suddenly, and cannot get your gun (fire?). Then, too, the potential of over reaction from a peace officer that could lead to a problem. People make mistakes; it would be easy to forget it as well. On me and concealed; I know where it is and it will be with me if I leave the vehicle for any reason. G26Raven and msgt/ret like this. I have an AG holster for one of my guns. This won't be joining it. I prefer something less obtrusive. Others I suspect wil eat it up. I have 2 of your products, this won't join it. As stated above I could only imagine a police officer walking up to my car and a gun front and center regardless of state laws. It looks like a quality item and for some it may fill a unique personal requirement that other things can’t. It beats sliding a revolver under the left leg, for example, for people who need to (body guards, some LE missions, etc). But... I’m generally not a fan of handling carry guns a lot. Every time a gun is drawn out of an on body carry holster and transferred to a vehicle mounted holster (any of them, from any manufacturer), and then later moved back again to an on body holster to exit the vehicle, there’s a risk for an ND. For the average carrier this could be a greater risk than suitable for the environment. Hmm , might be another potential market for those with mobility issues ( wheelchair, scooter).